Gracie's Trips – and her reflections. Mode of Transportation: Public Utility Vehicles (Bus, Multicab/L300) to Don Carlos, Bukidnon. *If you are from Musuan or Valencia City , the fare ranges from Php 25.00-35.00. It wasn’t my first time to visit this place. In fact, I visited the lake when I was still in high school though I’m not yet a full-time nature lover at that time. The lake is said to be guitar-shaped. Compelled to have an ecotherapy session, I decided to visit this place and asked my friend Sam to accompany me. The entrance to the lake is still being constructed although there are other ways to access the lake from different directions. It was one summer afternoon when I went here and I can only hear the crisp snap of dry leaves under my shoes. People sitting by in their mats, friends having their picnic or family strolling around either by motorcycle or just walking are the common scenes you can usually find here. I have friends who camp here over night though I haven’t experienced that one. Very apparent in the lake is the presence of water lilies. In fact, they occupy about two-fifths of the lake. That’s from a nurse’s estimation point of view, and it may not be accurate like those with engineers. I was told that there’s too much water lilies now. They need to be taken out in order to balance the ecosystem in the lake. I don’t know much about this one though as I’m not into Biology or Ecology but I love the fact that lilies are occupying the lake to remind me and us of their purpose. The lessons taught to us through the lilies are captured beautifully in this statement. Now that is powerful! The lilies are indeed beautiful. If this is so and if God can make the nature beautiful, then how much more our lives? The worries of this world and its cares have stressed us a lot but God told us to consider the lilies and learn from them. What reassuring thoughts! God didn’t just make us to survive, pay our bills, work hard and strive hard in order to live in this cruel world. He made us to enjoy too His wonderful creation. He is the one who nourishes every root of the plants. Should this give us peace that He is much more concerned with the details in our lives more than the flowers and plants? Will He regard us (for whom He sent His son to die) more than these flowers? Certainly Yes! And this should always remind us of His love every time we see flowers. God offers something more than any earthly lover could offer. I continued my lake stroll to finish my one round and found out that it will take you more or less an hour to walk around the lake. The lake is also the main source of water district for their water supply. I saw one truck here filled with water from the lake. My friend told me this is used to water plants in a plantation. When I was done with my one round, I didn’t linger any longer and went home as it was starting to get dark. It was one of those lily-filled, lesson-filled and “moneyless” ecotherapy sessions with God through His great classroom- the nature. Mode of Transportation: Private ride (until Mt. Capistrano,Simaya); Bus (until Bangcud Sayre Highway only); then Hired Multicab for big groups/Habal-habal (motorcycle) for smaller number of people– Bangcud to Simaya. Arrangement: No entrance fee yet. You can ask around for guides or you can go without guide. Ideally, it is best to go to the Barangay Hall and log in the names of the people going. You can also log out upon going down. Home to four of the ten highest peaks in the country, Bukidnon has always a lot to offer in terms of nature. If you are not yet a certified mountaineer, but planning to tread this path, you might want to consider day hikes in Bukidnon. The infamous Mt. Palaopao, Mt. Capistrano and Mt. Musuan should be on your list. Or should you be preparing for a major climb like Mt. Apo, then these day hikes are among the best mountains for you to practice. Mt. Capistrano, located at Sitio Simaya, is part of Malaybalay City. This mountain is famous in social media. 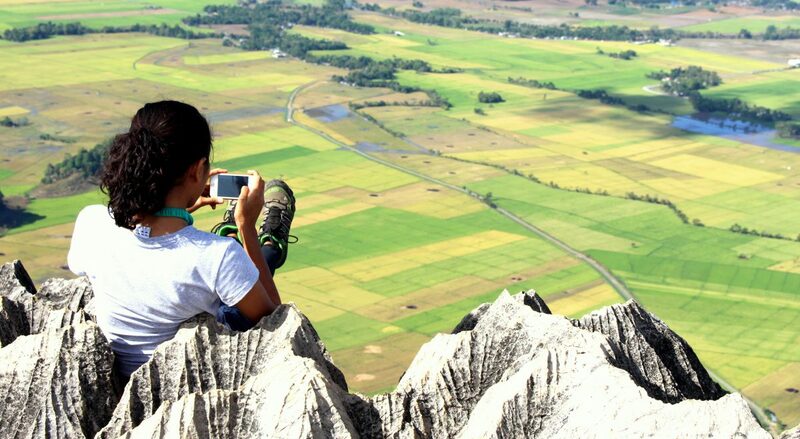 People get curious of the photogenic rocky mountain which is a trending destination for most people around Bukidnon. To complete my day hike list and to experience the so-called Capistrano Rocky experience, I enlisted myself for the hike. If you are from Valencia, and you see this intersection in Bangcud, turn right. We arrived at 5 am and planned it this early in order to catch the sunrise and to avoid the summer heat on the later part of the morning. Sam, our friend who used to go here, is our guide and we just followed him. It was still dark and we started with the concrete stairs going up. Sam told us that this consisted of 300+ steps. One technique I learned is not to hurry so you will not get tired easily. Sam taught us to climb with one foot, then put the feet together then repeat and alternate; rather than climb with one foot then another foot in ascending. This may be a slow pace but this really didn’t tire me easily. I just felt it was really a good start. I wasn’t so tired but I’m starting to sweat. True enough, the trail going up is really steep. We were blessed because the soil is not so dry which will not make us slip easily. We also stopped at certain points to hydrate ourselves. This is really important. The darkness was starting to fade away and upon looking around, the view of the rice fields welcomed us. Another steep trail awaited us. We were gripping to anything we can hold on to. This has been one of the challenging trails I’ve been to so far. I can really see that the trees here are lying down. We managed to climb up (thank God!) without slipping. You really need to use your arms also upon going up. We arrived at the Bamboo area and rested for a while. It was a relief after that sloping area experience. As we proceeded, the rocky area starts to reveal itself. Our trail was mostly composed of rocks. We climbed and went down. This went on like a cycle. We usually ask Sam if we are near in order to manage our expectations. We arrived at the camping site. Some people tend to camp here during the night in order to experience sleeping here and the breaking of the dawn and sunrise. When we saw the rocky formations, then we were sure we are already at the summit. Sadly, there were garbage around left by some climbers. I hope this shouldn’t be the case next time. The view unfolding before us. When we arrived there, there were campers who stayed overnight at the site. We ate at an area between two boulders and enjoyed my vegetarian (always) breakfast. We arrived at 7:05 am. That’s about 2 hours of hiking and resting as well. After that, we explored the summit area and there are just rocks everywhere. Most of the area are covered with rocks. There’s not much flat ground I should say. Meanwhile, we enjoyed climbing up on them and we effectively used some of our rock climbing skills. Visible on the rocks are vandalism. This is not a good thing though. :(. This is the view around the summit. We spent about 2 hours at the top. We joked around that we spent 30 minutes for eating, 30 minutes for rock climbing and picture taking then another hour for negotiation. It was really hard to climb to the rocks since you might really fall down as there are gaps in between them. We spend a lot of time thinking whether to go or not. But it’s good that Sam, our climber friend, is willing to assist us because the rest of us are girls. The heat of the day didn’t hinder us from exploring more. There are 2 major rocks here where people usually take a pose. It’s a bit dangerous without precautions. So always think of safety first rather than thinking of a feat you can post on social media. Thankfully, we were able to make it to the 2 big rocks (with much prayers). The famous rock here and my favorite shot. Overlooking the rice fields and surrounding mountains. The mountain is strategically located where most of the famous mountains around can be seen. It has a really good view I should say. Mt. Dulang-dulang on the left; Mt. Kitanglad on the right. These are two of the ten highest peaks in the Philippines. After spending two hours on the summit, we decided to go back. There were other groups also who went climbing. This has really been a famous mountain in Bukidnon. Bidding my farewell to this mountain. It was actually a great accomplishment for us to reach the summit. But we were actually worried a bit upon our descent. It will sure be a steep one. True enough, I had to go down backwards just so my feet won’t hurt. Another thing we discovered is that we can go mountain sliding in order to go down. It was really challenging not to mention the heat of the scorching sun. Upon seeing this, we were sure we are nearing the base. Finally arrived at past 11 am. Most likely our climb here in Mt. Capistrano is a half-day activity. Every mountain conquered is not only a physical feat for me. This activity is always a time to learn lessons. It was still dark when we went up and we couldn’t see the peak. At the back of my mind are what ifs. What if there will be a snake or harmful animals? What if we fall down on the cliff? What if there are bad guys around? These were the thoughts going on in my mind but I just kept climbing up. Life could just be sometimes like that. It could be that we are in our darkest times right now, we don’t know what lies ahead. We are afraid– afraid of the unknown because we couldn’t see anything, we couldn’t have a glimpse of our future. But what keeps us going? It is our faith in God. When we take God at His word, we just keep going even though we can’t understand why. It is trusting Him that He has the best interest for us and believe that the breaking of the dawn will come and things will be clear to us at the right time. When we were on the steepest part of the trail, Sam told us that we are near. This made a mark on my mind. I was thinking that when we experience severe trials in our life, it could mean that we are nearing home. Indeed, when we are on the closing part of the Earth’s history, each one of us will be severely tested. Just like on that steep part of the trail. In connection with the trials along the trail, I saw vine ropes along the way which I used in gripping for the steep trail. When there are trials and challenges along the way, God will not leave us but He will send help along the way. We are not left to battle our own challenges. And with this, we are sure not to fall because the help is from Him. I also realized that when we are rooted in God’s love and in His word, just like the vine ropes, we will not be uprooted. We just have to abide in Him always. With my Capistrano experience, I can always say “Mt. Capistrano, you rock!” It was worth climbing up and I still would want to go here in the future. Author NellgraciePosted on March 9, 2016 March 10, 2016 Categories Bukidnon, My HomeTags Bukidnon, My Home, itsmorefuninthephilippines, malaybalay, mountaineer, mt. capistrano, philippines, simaya, sitio binalbagan, things to do in bukidnon, things to do in malaybalay, things to do in simaya, touris11 Comments on Mt. Capistrano: You Rock! Nasuli (which means National Summer Linguistic) has been part of my life. American missionaries (from Summer Institute of Linguistics) used to be here and live here but since their mission was finished, they went back to their place. A visit last August 2015. Despite the absence of seas in Bukidnon, it is blessed with an abundance of springs. One of which is the Nasuli Spring Resort. Nasuli (which means National Summer Linguistic) has been part of my life. Years ago, American missionaries (from Summer Institute of Linguistics) used to be here and live here but since their mission was finished, they went back to their place. The name was based on a Bisaya term which means “reversed.” According to my research, the locals named it ‘nasuli’ because “the spring’s headwaters’ elevation is much lower than the lagoon.” Thus, this seemed like the water is flowing in reverse. I used to visit this place when I was still a child for church gathering or recreational purposes. After 15 years (perhaps) in my life, I went to this place together with my family. It was a Sunday and we planned to eat our breakfast somewhere with a natural ambiance. We thought of revisiting Nasuli which was perfect for that purpose. The spring is located in Bangcud which is not very far from Valencia. If you are from Valencia, you need to turn left if you see the sign going to the spring. The view that welcomed us. This used to be filled with trees and nature before. But it was now replaced with cottages/tables and chairs on the surrounding areas. There is not much facilities here (like lifeguard etc.) so you need to bring your own food and be careful when you are swimming. It’s better to go in groups. We were the only people when we went here so at that time it was very peaceful. It was a lovely place to just reflect and reconnect yourself with the nature. Bluish water is evident in this place which makes it really attractive and photogenic. Not many people visit here often but I usually like places like this. Simple nature, not so many people and just peaceful ambiance. If you didn’t rent a cottage, you can just place your things here in the benches. An addition that I have seen after I revisited are the diving boards. If you didn’t intend to to do swimming, then at least pose for a picture here. Amazingly, this red diving board is really photogenic. We didn’t really swim here at this time so we spent our time taking pictures. The place is just so lovely and serene! Because we went here to eat, we rented for the wooden tables and chairs. You can find this if you go further to the Red diving board. The view of the spring from where we ate. It always amazes me how God teaches us through nature. At this time, I was impressed of object lessons regarding springs. Most of the reviews I read from the internet about this spring is that it is beautiful but not well-maintained. This is somehow true! As someone who have seen the place before, I can say it is more “natural” before compared now. This taught me that it could be our lives are beautiful but it is not well-maintained. The complacency may come from the view that “I am okay” or “I have arrived” or it may come from our failure to drink daily of the springs of living water. We are to obtain spiritual refreshment from the living spring of God’s grace and mercy always. This is my favorite shot of Nasuli. This shows the groundwater flowing up with weeds around characterized by a bluish color. The text mentioned above gives us a really good lesson relating to springs. The first line “whoever drinks of the water that I shall give him shall never thirst”- this means that we do not thirst for the world’s advantages and attractions but our desire is to only drink from the water that God can give. Another aspect of this text is that we are God’s channels through which the water of life will flow. Because we have an indwelling Savior, He will be unto us a well of water, springing up into everlasting life. If we have God as our source of springs of living water, then this can be evident in our lives and it will spring forth to others. I hope that the beauty of this spring will be maintained but may it also be kept clean and may there be more improvements without compromising its natural beauty. Let us help in keeping this spring beautiful for our future generation. Special thanks to Ms. Krian Soreño for some of the information in this article. Arrangement: You need to ask permission from the Purok Leader of Sitio Palaopao. Since I was a child, Mt. Palaopao has been my favorite mountain and it has captured my heart since the first time I saw it. Standing at 836 ft above sea level, it is also dubbed as Palaopao Hills because of a chain of mountains in it. When traveling to CDO, I can always see this from the highway and it made me feel like it was from another place outside of our country, like those seen in the movies. I didn’t know a lot of people hike here, especially during the Holy Week, until my best friend asked me to join the climb. I said yes of course! I saw someone who posted on facebook about Palaopao Hills with a caption “not in Scotland, Ireland or New Zealand… but in Mt. Palaopao”. True enough, this rocky mountain resembles those mountains seen in the aforementioned countries. With this fact, I couldn’t help but go and climb this mountain for the love of exercise, hiking, photography, nature and God. Why go to these countries when you haven’t been to Palaopao yet? But of course, I would love to visit these countries someday. Bukidnon is home to 4 of the Philippines’ top 10 highest peaks– Mt. Dulang-dulang, Mt. Kitanglad, Mt. Kalatungan and Mt. Maagnaw. If you are not yet prepared to climb these peaks, or do not have enough time, most hikers/bloggers would recommend you to climb Mt. Palaopao and Mt. Capistrano. I also added Mt. Musuan (Musuan Peak) to the day hike list. From Valencia City, we took a bus going to Sumilao. We started traveling at 7 am and arrived past 8 am. Before starting our this rocky adventure, we stopped by and ate our breakfast at the food court of Sumilao Public Market. To be able to go to the mountain, we need to hike through the wet market. In here, we were able to observe the way of life of the people. Wet market with Palaopao Hills on the back. Before we even climbed there, we took pictures as we were amazed of our favorite mountain. With my best friend, Ai-ai, who also loves to climb mountains. We passed by the rice fields and were able to observe the livelihood of the people living here. At this point, we were able to have an overview of Mt. Palaopao. As one blog stated “it is deceitful yet breathtaking”. It is deceitful because you need to go down into a gorge, then go up again to a community to be able to arrive on the foot of the mountain. Just wow! What a beautiful view! The first 2 mountains on the left side is where we will be trekking. Hiking down, a lovely view awaited us. We passed the Kulaman River through a hanging bridge. We finally arrived at this small community in the foot of the hills for about an hour. We had to wait for a few minutes for the Purok Leader so we can get the permit. This is necessary so that the purok leader will know that a group of people (with names listed) went up the hills and also for security purposes. We also asked a kid, Marvin, to be our guide. We started our hiking at past 10 am and passed by these places. There were only three of us who hiked in this mountain plus the guide. Since this was planned just a day before, we weren’t about to prepare physically. So that I really palpitated. On day hikes, especially for open trails which was very hot for us, it’s very important to be well hydrated to avoid or minimize discomforts. Thankfully, nothing happened to me. We just hiked at our own pace and my buddies were very patient enough to wait for me. So that it’s really important to have a regular exercise program. We had a glimpse of of the rocky mountain on the first part of our hike. Not in Scotland, Ireland or New Zealand. Going further is the cross stationed on this hill. On our right side is the rocky part of the mountain. One can notice this when you are traveling to Cagayan De Oro city along the highway. On this side of Mt. Palaopao, the lime stone wall. And of course, you wouldn’t want to miss taking a picture on this angle. Lime stone wall of Mt. Palaopao. We hiked further going to the top of that rocky side. You can see the community on the foot of the mountain from this part here. Finally we arrived on the top of the mountain. It took us about 2 hours from the foot of the mountain (with rests). We spent at total of 3 hours together with the waiting time and our hike from the public market. We discovered through an article that, before, the top part of the mountain was covered with virgin forest. The side contained caves, rock shelters, lime stones overhangs containing wooden coffin and artifacts which can be traced back to metal age. Wow, this must be like Sagada before. The locals also told us that the place used to be submerged in water (perhaps hundreds/thousands of years ago). Thus, the term Palaopao from the Cebuano word “lapaw” which means spill or overflow. This would also explain the rock formations which are coral-like; thus, it may really be possible that this place was submerged before. We arrived past 12 pm and ate our lunch at this rocky top. I settled myself on a tree where I enjoyed the view. My buddies settled themselves on the rocks. We cherished the time spent here by meditating, reading, relaxing and sleeping for 1 hour plus. It was worth it! Beware: There may be snakes around here so just be careful. We find one but we saw it first and it was a bit distant from where we were hanging out. Thankfully, we weren’t harmed and this didn’t hinder us from enjoying. The only way is the way to the cross. People come here during the Holy Week as their pilgrimage. Such is paralleled with our Christian walk. Life is a journey; but the only way for us not to be lost in this world is to look to the cross for this is the only way. On our way going up, we saw the cross and we were sure we are going the right way. I always love to read while in nature. This made me more receptive to spiritual lessons. In time for this rocky adventure is the statement I came across with, saying, “Are our feet planted on the rock of God’s immutable word?” This is a thought-provoking and sobering question. Do our daily decisions reveal that we are founded on God’s immutable word? or do our reading of His word not manifested in our lives at all? Where do weary hearts go? To the mountains. Why? Because Jesus is there. Don’t get me wrong here. But I believe that when we are in nature, we think of the Creator and it makes us more likely to contemplate about Him. Hiking means work and obstacles. So that being at the top of the mountain means success, overcoming and REST. At this time, I was able to find the solace and rest that I needed. Indeed, I purposely came here to take away the stress as science would prove it very helpful. But most of all, I came here to commune with my Savior, the only One who can give me rest. It was past 1 pm when we started going down.This is the view on the top of the mountain with my trekking buddies. We went back to our trail.We need to cross again this area in order to go back. Because we couldn’t get enough of the beauty of Palaopao…..
We stayed for awhile in the community, rested and asked for water. We crossed again Kulaman River Bridge. This rocky adventure turned out to be a great blessing for me. With Palaopao as my favorite mountain, I can always say “Wala’y makalapaw sa Mt. Palaopao (Nothing beats Mt. Palaopao)!”. The mountain in four vantage points. Tukuran, which came from the Cebuano word “tukod” which means “to build” or “to construct”, is regarded as the Beach Capital of Zamboanga del Sur. Arrangement:Entrance (Php 10.00-20.00 pesos as far as I can remember); Cottage for resting or eating (Php 300.00-1,000.00). I intentionally planned to go to Maranding, Lanao del Norte in this trip to accompany a friend. We visited a friend whose domicile is in this place. In the place where we stayed lies wide rice fields and a lot of coconut trees. Houses are not built very close to each other because of the vast fields.With this, life is peaceful and I appreciate the simple life in this community. Mr. Sun greeted us the next day as we planned to tour around the place. Our host planned on bringing us to a beach but little did we know that we are crossing another province/region. Tukuran, which came from the Cebuano word “tukod” which means “to build” or “to construct”, is regarded as the Beach Capital of Zamboanga del Sur. This municipality is bounded by Lanao del Norte on the East which explains its proximity. This coastal municipality served as a passageway for Regions 9 and 10. This made me amazed because of the ways going to Iligan City and then to Cotabato City. I felt geographically lost since I’m not good with geography (I think). They brought us to Sirena beach and this view welcomed us. The place has an amazing view and I am excited because I was able to set foot on Zamboanga which was my first time. Although I never thought it is that extraordinarily special, this place marked a special place in my heart and brought out the child in me. This is the view going down the shore. Cottages can be rented for eating and staying. One can notice that the shoreline of this beach is not that prominent. It is filled with rocks and boulders. Just like any of us who wants to play in the sand, this beach may be a bit frustrating at first; but what made this special is that the people here are creative. So they put up floating cottages so that you can enjoy the swimming despite the big waves and the rocks. One of the floating cottages. These native and playful cottages can be reached with this bamboo raft. You just need to pull the rope so that this raft will move towards the floating cottages. Exciting and fun, isn’t it? Chillin’. Just like a boss! The first cottage has a net on the center which makes it a netted swimming pool. So one can still enjoy swimming in the sea despite its depth because its safe since there’s a net. Children love to play here and also adults. I just think that this is a very creative and cool idea! It just proves that you can really enjoy if you like wherever you are. Then there’s this Play Therapy for kids… and for adults also. We enjoyed this tire-swing. The second cottage is a little different than the first cottage in the sense that it has a diving board with a longer “netted swimming pool”. The second cottage is connected to the third cottage. We explored the area and visited the adjacent beach resort which was just accessible. The shoreline here is prominent where one can truly play with the white sand. This resort looks not operating though. Identified as Baguio’s beach resort. There is also a rocky part though most of it are sandy. This place will always have a place in my heart because of the floating cottages that made us play like kids. Adults need Play therapy regularly so as to relieve stress and just be lighthearted. This place taught me not to be childish but to be childlike. God bids us to be like the children.To be like a child means to have full confidence and to fully trust in our Father that He has the best interest for us and that He will never leave us. This also implies that being child-like is to have a simple faith– trusting God always and obeying Him instantly whatever He says.A childlike spirit is trusting and forgiving. “The most childlike disciple is the most efficient in labor for God.” Be childlike. I went home with a fulfilled heart from the fun of discovering something new and setting foot on a new place. It was indeed worth building memories with Tukuran, the beach capital of Zamboanga del Sur.